You are only steps away from the Beach and Ocean. This is the best value for an ocean view house so close to the beach. 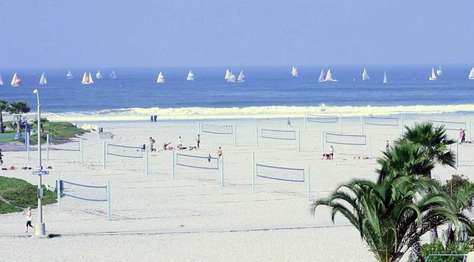 You will be staying on the ocean side of the court in beautiful Mission Beach, San Diego, California. The house sleeps 9 ( total number of beds) to 22 ( if you put 2 in a bed ) as a 5 BR, 3 BA. The bonus is the home has a lot of outside space. There are 3 outside decks.The Ocean level deck has a natural gas grill great for barbecues. There is also a private deck with a Jacuzzi in the back of the house and an Ocean view deck on the roof. Included are 2 small parking spaces in the garage, which also has room for storage. The house is equipped with all that you could possibly need for a vacation home with high quality comforters, linens and towels. Fully furnished with modern furniture and new super comfy beds. There are 5 LCD HDTVs with premium channels and turbo speed Wireless Internet, and an Xbox 360 with plenty of games and DVD movies. The main kitchen is very large and includes all the cooking utensils and appliances that you may need. There is a second kitchen in the room that is part of the house upstairs perfect for entertaining. The property has a full size washer and 2 dryers in the garage. Recently remodeled granite Kitchen Counters and cabinets. Beautiful new wood flooring and Saltillo tile throughout the home. This is the quintessential big beach house in Mission Beach. In the living room there are also 2 very comfortable Euro Couch futons. **Standard rates are based on 9 guests. Extra Guest fee of $25 per night for each additional guest. Infants less than 2 do not count towards the guest count. Prices are subject to change without notice and are based on occupancy and seasonality. ***There is a 3% fee for Credit Card Payments with security procedures. We do not accept AMEX. ****If you are booking on another website other than our own, your credit card will not be charged until we have approved your booking. The reservation deposit varies per property and we will Contact you prior to charging your card. By sending an inquiry or booking on another site, then you are agreeing to pay their booking fee which is added to the total of your booking. This amazing, Ocean Front Building Luxury studio can sleep 2. Perfect location - near all food, coffee, shopping. 180 degree views with a huge patio, BBQ, bike parking. The beach house is loaded with features including a swing arm mounted high def PLASMA TV, DVD, Lava Lamp, under counter lighting, pendant lighting and so much more! The Calvin Klein sheets, towels & pillows come from a 5 star luxury hotel supplier. Every detail is attended to. This amazing, oceanfront, large one bedroom apartment is located on the ground floor and can sleep up to 8. Perfect location - near all food, coffee, shopping. 180 degree views with a huge patio, BBQ, bike parking. The beach house is loaded with features including a swing arm mounted high def PLASMA TV, DVD, Lava Lamp, under counter lighting, pendant lighting, GE Profile kitchen, built-in Washer & Dryer, and so much more! This is a ground floor vacation rental home, which means that you open the front door to walk right out onto the boardwalk and beach! This spacious two bedroom condo sleeps 8 people comfortably. There is a king size bed in the master bedroom, two full beds in the second bedroom and a queen sleeper in front room. There are two bathrooms. The master bath has a shower and the second bath includes a bathtub. 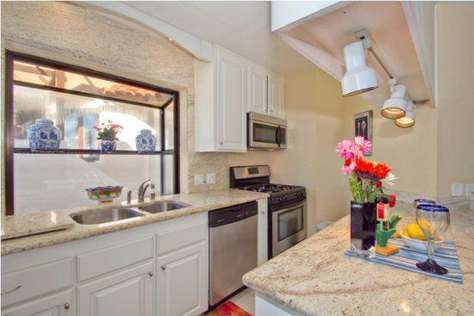 The kitchen comes complete with everything you need to enjoy a home-away-from-home vacation rental on the beach! There are many high end treatments making this vacation rental comfortable and accommodating including travertine throughout, granite countertops, stainless steel appliances, washer/dryer in the unit, dishwasher, wireless internet and parking. There is a community patio with a large stainless steel barbecue and picnic tables. The patio has a view of the ocean! There are views of the water from all west facing windows! That means you will be watching the sunset into the ocean from the comfort of your living room couch! Pets are accepted in this property with previous written permission! 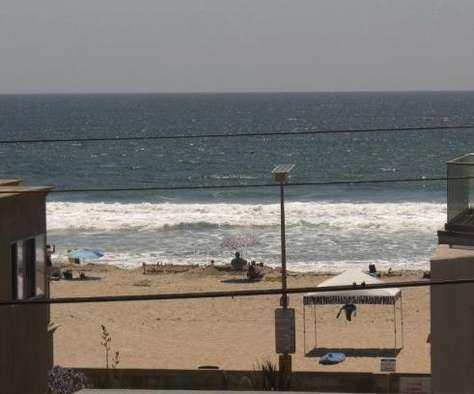 This vacation rental condo is located on the second floor of our oceanfront building. That means you will have breathtaking views of the sun setting into the ocean from the comfort of your living room! 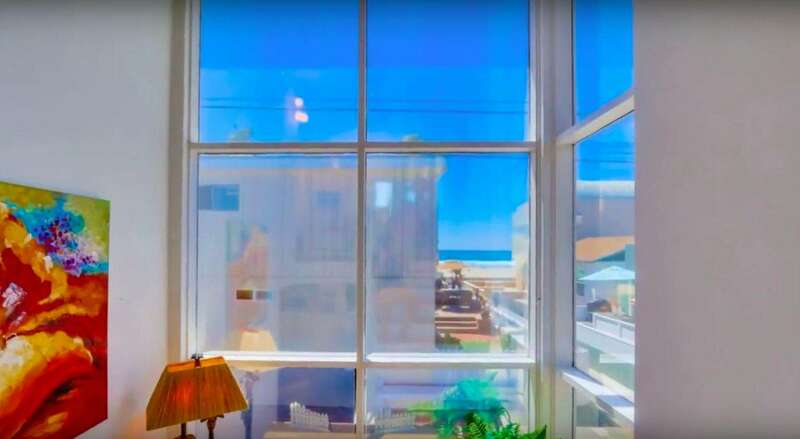 The beach and boardwalk are also available for people watching, however because this vacation rental is on the second floor nobody will be watching you! The elevation above the boardwalk offers privacy and solitude. 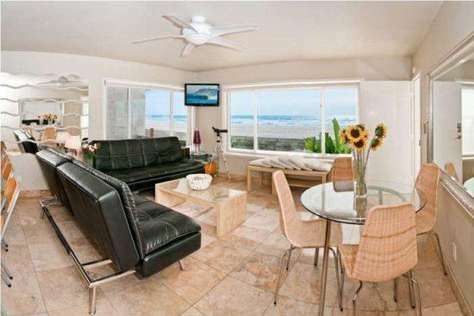 This spacious 2 bedroom vacation rental condo sleeps 8 people comfortably. There is a king size bed in the master bedroom, two full beds in the second bedroom and a queen sleeper in front room. There are two bathrooms. The master bathroom has a shower and the second bath has a bathtub with shower. The kitchen comes complete with everything you need to enjoy a home-away-from-home vacation on the beach! There are views of the water from all west facing windows! You and your family will enjoy watching the dolphins swim pass as you eat breakfast from your dining room table! Mission Beach House located on the 3rd floor can sleep up to 9. Private staircase or elevator. Great location - cross street YORK - near all food, coffee, shopping. 180 degree views with a huge patio, BBQ, bike parking. The beach house is loaded with features including a swing arm mounted high def PLASMA TV, DVD, pendant lighting, GE Profile kitchen, built-in Washer & Dryer, and so much more! The Calvin Klein sheets, towels & pillows come from a 5 star luxury hotel. Every detail is attended to. This amazing house won "House of the Year." Multi-levels of impeccable decorating. Located on the boardwalk of Mission Bay (ocean less than one minute). Bay view of famous "Sail Bay", downtown, La Jolla, and 360 degree views from the roof deck. Amenities: 25' High SS Fireplace, Phones, Fax, Wireless Internet, Air Conditioning, High Definition TV, Cable TVs, VCRs, DVDs, Stereos, CD Players, Full High End Black Granite Kitchen, Microwave, Dishwasher, Refrigerator, Ice Maker, Cooking Utensils provided, Linens provided, Washer & Dryer, 10 h.p. Jacuzzi w/Fiber Optic lighting & Stereo built-in, Private Steam Shower, 2 Car Garage, Outdoor Gas Grill (BBQ), 12' High Moving Glass Bayside Panels. 3,000 feet including sunken living room, 25 foot high stainless fireplace back lit by blue neon, black granite floors, wet bars, gorgeous office with full wireless internet, fax, printers, etc. Steam shower, sunken tub, Stearns & Foster beds, nine feet by eight feet master Roman Carrera white marble, 24k gold fixtures, Stained Glass throughout by NY Met artist. The drapes are electric with black out curtains, fully air conditioned, huge roof top entertainment deck with Jacuzzi/fiber optic lighting and stereo. Huge home theater in living room and master suite with stereo music/dvd/vcr/cable piped into every room. High Definition televisions. Large Oceanfront Duplex on two levels with amazing views in beautiful South Mission Beach. 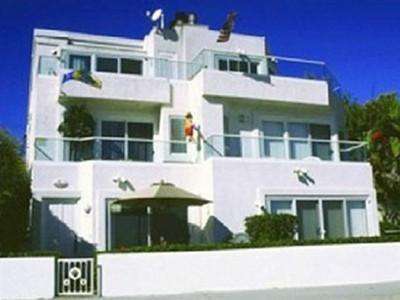 There are 2 separate units in this luxury oceanfront building called the Seabreeze (Beach House). The units can be rented together for a total of 4 bdr 4 ba sleeping 16. In this way, you have the possibility of an entire building for your family vacation. Surf and Stars Penthouse is freshly renovated with high ceilings, corner full ocean view. Sunny balcony with stunning ocean views. Large entertainment kitchen with center island, bar stools, dual Euro-Lounger couches, adjustable Plasma TV. Two full baths with two bedrooms. 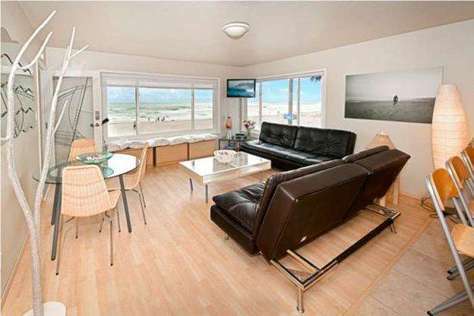 This brand new ground floor beach studio is perfect for a couple or small family. Located just 10 seconds from the ocean but full ocean view from kitchen and dining table. Full kitchen along with dining for 4, living room with 1 full Euro Lounger couch reclines into a bed, nice sized master bedroom with queen bed, closet, etc. The Penthouse is freshly renovated with high ceilings, corner full ocean view. Sunny balcony with stunning ocean views. 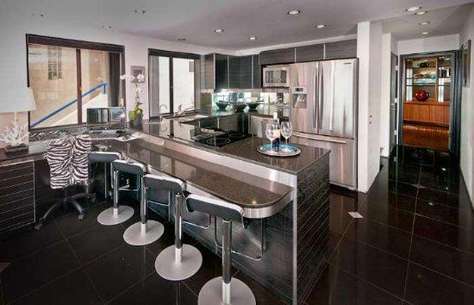 Large entertainment kitchen with center island, bar stools, dual Euro-Lounger couches, adjustable Plasma TV. Two full baths with two bedrooms. This brand new ground floor beach 1 Bedroom is perfect for a couple or small family. Located just 10 seconds from the ocean but full ocean view from kitchen and dining table. Full kitchen along with dining for 4, living room with 1 full Euro Lounger couch reclines into a bed, nice sized master bedroom with queen bed, closet, etc. In the best location on the beach - 2 minutes walking to the best restaurants, coffee, shopping, rentals, bars, attractions and especially Mexican food! Come with a parking spot on site, fast WIFI, adjustable Plasma TV and an amazing Mission Beach Ocean View!!! Full kitchen with gas oven, full size refrigerator with ice maker. Queen bedroom set in the master along with a 6 drawer dresser - nice sized closet. Living room Euro Lounger lays into a full bed, glass dining room set with 4 chairs. Bathroom with shower, mirrored medicine cabinet - all upscale! No keys just simple door codes. The condo has a fully outfitted kitchen with gorgeous stainless countertops. On the patio you will find a gas grill and a sit up bar area where you can sit and enjoy coffee or a glass of wine and enjoy the bay view. From the wide open window doors you can feel the ocean breezes while sitting comfortably inside on the couch. And evening summer fireworks are visible from across the bay at Sea World. The condo is on the more peaceful and quiet bayside, but less than a 2 minute walk to the Ocean. The beach directly out in front is a favorite family beach with good swimming. It is just a few blocks to Belmont Park and a mile to Crystal Pier. About 5 minute drive to Sea World. This Bay Front condo is top of the line. All of the furnishings are kept up to the highest standard for we have chosen high-end furniture and accessories in order to make our condo look enticing as well as comfortable for our guests. The gourmet kitchen has built-in appliances, large cabinets, caesar stone counter tops and sky light ceiling that keeps the kitchen bright and sunny. See where function meets beauty in this top of the line kitchen. Central air conditioning keep things cool, but is rarely necessary due to the nice ocean breezes. The master bedroom suite has a large attached bathroom with two vanity sinks, marble counter tops and a large Roman tub. The private toilet/shower area provides maximum privacy and functionality while getting ready for the day. There is a 2nd master bedroom en-suite with office area and/or comfortable reading spot. All bedrooms have a TV and private patio decks. To top it all off, enjoy the SeaWorld FIREWORKS nightly from the opposite side of the Bay as you sit on the deck or relax on the sofa in the living room! 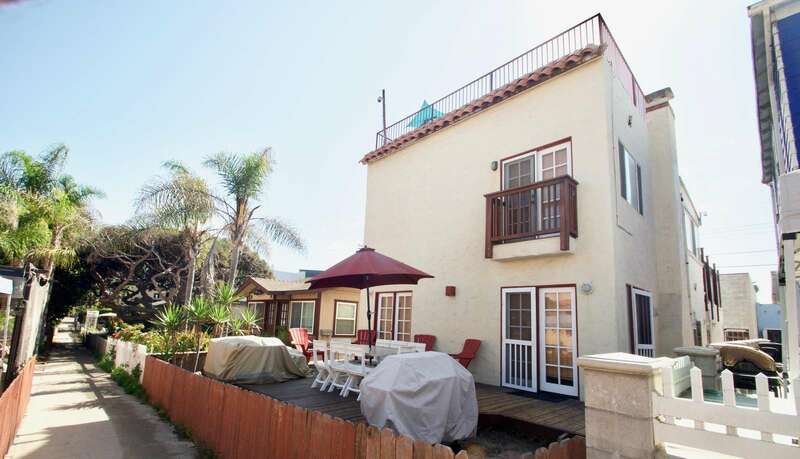 The large beach house is located steps from the famous Mission Beach. 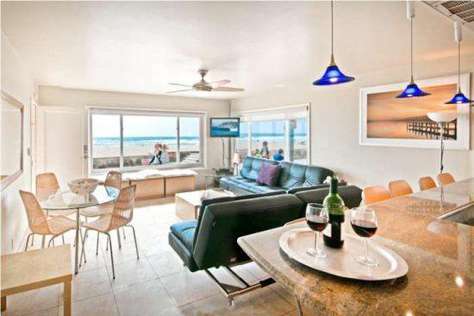 This new beach house is being offered as a premiere vacation rental starting June 2012. Ceiling fans throughout, large Plasma TVs, WIFI and an amazing large 360 roof top deck. Sit under the stars in our loungers or grill up some food on our roof top BBQ. Main floor kitchen with table & chairs, main floor bedroom with bathroom. Upstairs another kitchen with two bathrooms, two bedrooms. Outside deck off this level. Climb upstairs to our amazing roof top deck. 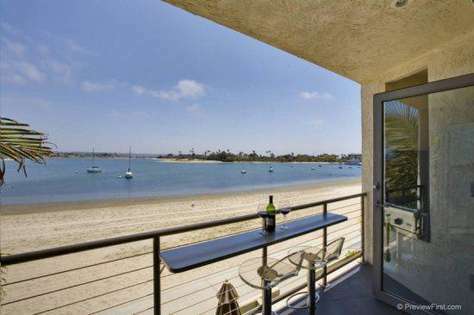 This extra large, 2000 square foot oceanfront luxury penthouse condo is located on the southernmost tip of the Mission Beach peninsula with both the Pacific Ocean and jetty at your front door, and sweeping views of Mission Bay on the other side. As one of just several three story buildings in Mission Beach, this penthouse luxury condo is at a commanding point for breath taking views. Panoramic views abound from the 180 degree, floor to ceiling, all glass living room picture windows, as well as all other rooms and three balconies of Mission Bay, Pacific Ocean, and jetty. Other views include Sea World fireworks during the summer and holidays, and luxury yachts coming and going through the jetty. Just steps to the beach, with no noise from the Boardwalk. All amenities are included for a first-class vacation experience. Luxury appointments such as wall mounted flat panal TV in living room, flat screen TV's in other bedrooms, marble floors, granite counter tops, recessed lighting, and of course, million dollar views. A gas fireplace and luxurious leather furniture are provided in the livingroom. The fully equiped kitchen and large dining area easily accommodates large gatherings. The master bedroom features a king size bed, flat screen TV, and a full balcony with incredible beach, ocean and jetty views. The other three bedrooms feature kings and bunk beds. Two double high self inflatable air mattresses and a pac n, play are also provided. Elevator and secure garage parking available for two cars. As one of just several three story buildings in Mission Beach, this penthouse luxury condo is at a commanding point for breath taking views. Floor-to-ceiling windows and two balconies overlook the jetty and Pacific Ocean. Other views include Sea World fireworks during the summer and holidays from the back patio, and luxury yachts coming and going through the jetty. This condo is just steps to the beach, with no noise from the Boardwalk. All amenities are included for a first-class vacation experience. Luxury appointments such as marble floors, recessed lighting, Jacuzzi tub, fireplace, and million dollar views are all included. A gas fireplace and luxurious leather furniture are provided in the living room. The fully equipped kitchen and large dining area easily accommodates large gatherings. Large screen TV in fully tiled living room. The master bedroom has a flat screen TV, full balcony with incredible ocean and jetty views and a king-size bed. The all marble and tiled master bath also includes a Jacuzzi tub and double shower. The hall bath also features marble and tile flooring with a Jacuzzi tub. The second (huge) bedroom has a TV and includes two full beds with view of the Bay, and the third bedroom, also Bay side, has a TV and includes a king-size bed. The fourth sleeping area is a convertible den with a queen-size sofa bed. There is also a queen-sized air-mattress for extra guests. Secure garage parking is provided for two cars. On the very tip of South Mission Beach, our home has beautiful water views in three directions. The bay, the ocean, and the jetty provide the best views in San Diego. This is a five-bedroom home that has been converted into a duplex. It is perfect for large groups or multiple families that desire to vacation together while maintaining some privacy. With two full kitchens and three bathrooms, there is amble room to vacation together with the luxury of personal space. This home is not your typical rental with bare walls and stiff sheets; it welcomes its visitors with all the luxuries and amenities of staying in their own home. The custom built details create the feeling of luxury and comfort with a spacious kitchen and custom cabinetry along with detailed lighting, an open layout and large paned windows that allow for the true feeling of vacationing at the beach. All three full bathrooms are beautifully customized with the master suite bathroom housing a large glass shower, a whirlpool bathtub, and two large vanities with dual sinks. 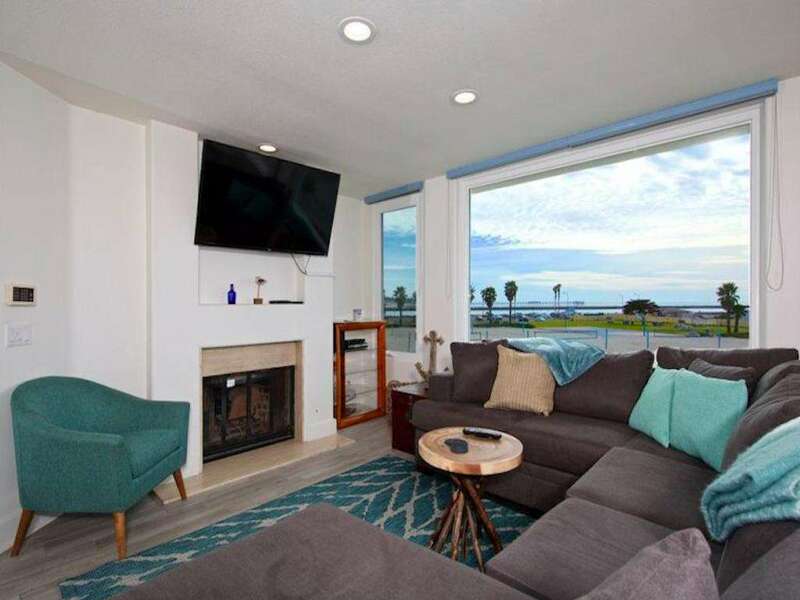 There are five televisions with cable and Internet provided as well as DVR recorders so you won't miss your favorite shows while enjoying all that Mission Beach has to offer. Within the two full kitchens there is dinner seating for 15 people. The five bedrooms have sleeping for 11 people comfortably. Three beautiful patios areas have plenty of lounging areas to enjoy the beach air and sun. The top two decks of this beautiful home overlook Mission Bay to the east, the Jetty to the South, and Ocean Beach to the West. The garden patio on the ground floor has a grill and two picnic areas. 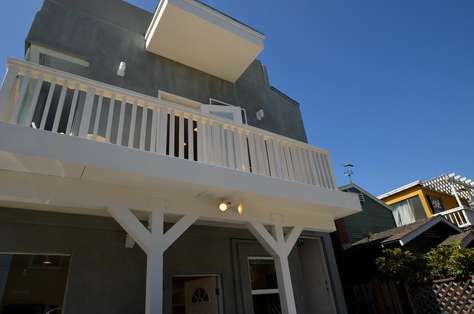 The 2nd floor balcony attaches to the master suite and third bedroom, and the very large rooftop deck allows for seating of 10 + people and features a firetable and an outdoor speaker with iPod connection. South Mission Bay offers a beautiful un-crowded white sand beach ideal for families with young children. Our home is steps to Mission Point Park, which features a playground for the kids, picnic tables, and grassy areas for bocce ball, horseshoes, or walking your dog. under the watchful eyes of the lifeguards at the South Mission Beach Lifeguard station. This is also the location of world famous volleyball courts where many tournaments are held. Beach-side and Bay-side walk ways offer miles of jogging, biking, walking, or skating pleasure. Parking at the beach is a rarity and this home mes with two parking spaces allowing for the storage of very large vehicles. The carport space can easily accommodate a SUV or a large truck! We provide plenty of beach toys, two beach cruisers, a two person kayak, a boogie board, surfboard, and much more! Why pay for equipment rentals when we provide it all for you? Plus, the outdoor shower lets you leave the sand outdoors and easily wash all beach toys. The stunning location allows for the enjoyment of Sea World's fire works in the summer as well as the ease and access to all of San Diego’s other beautiful sights and events. Welcome home! 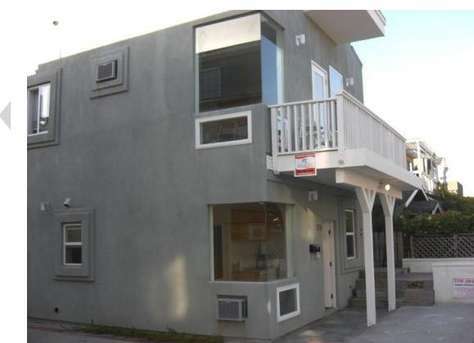 This newly remodeled ocean front condo is located just a few blocks north of Belmont Park. 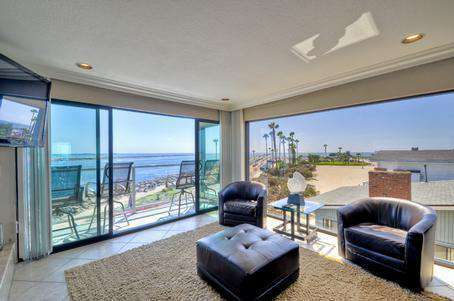 This Condo is in an Ocean front building in beautiful Mission Beach San Diego. Centrally located just North of Belmont Park and very close to Sea World. This 2 bedroom 1 bath condo is beautifully decorated and comes with all that is needed for a getaway to America's Finest City at the funnest beach in Southern California. Includes your own rooftop deck. Mediterranean Villa In Mission Beach. Large Kitchen / 2 Ovens + 2 Refrigerator / Granite Bar . Three-level Ocean Front property cannot be matched--the property is the ultimate for a BEACH HOUSE. 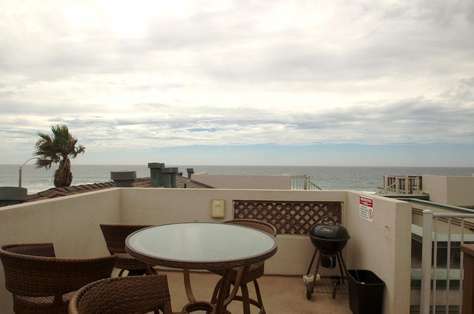 It has one of the largest ocean front decks in all of Southern California. Sixty-six feet wide overlooking the ocean and the bay; Appox.3000 square feet . LEVEL ONE is a Kitchen/Bar perfect for entertaining. Step Down Living Room with remote Control Fireplace. 60 inch PLASMA / BLU-Ray DVD Player and two Bedrooms on the First Floor with Full Cable TV and King size beds. DVD Players in each bedroom. There is also a Changing table for infants as well as a High Chair & beach toys & Crib & Pack & Play . BEDROOM #3 THE PAPI : The Master bedroom : A VERY ELABORATE CRIB with California King Size bed, FLAT SCREEN TV HI Def /DVD two-person Jacuzzi and Remote Control Fireplace. 4 French doors open to the ocean with deck & 6 bar stools . The fourth bedroom has a king size bed with FLAT SCREEN W DVD . 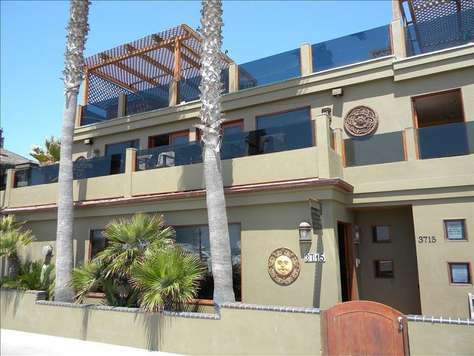 Large Oceanfront on two levels with amazing views in beautiful Central Mission Beach. This luxury oceanfront 3 BR 3 BA has stunning Ocean Front Views from the Living Area, Modern Kitchen, Dining Room and Balcony. The Living area has a fireplace and large HD TV perfect for relaxing during your stay. Or you may want to sit outside and above the beach world on the Oceanfront Penthouse Balcony and watch the waves in the spectacular Pacific Ocean. Or enjoy a barbecue as there is a gas grill with table and lots of chairs. The 3 bedrooms are luxuriously furnished and the Master has an amazing large bathroom with custom tiles and granite top surfaces. 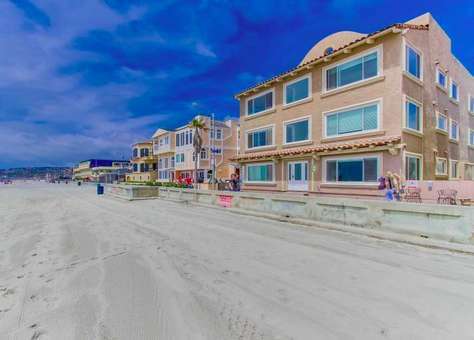 Centrally located the condo is close to all of the attractions of Mission Beach including Belmont Park and The Wave House. This is fine Oceanfront living in America's Finest City. Great location near all food, coffee, shopping. 180 degree views with a huge patio, BBQ. Two beach condos loaded with features including swing arm mounted high def PLASMA TVs, DVD, IHome sound system, under counter lighting, pendant lighting, Two GE Profile kitchens, built-in Washer & Dryers, and so much more! 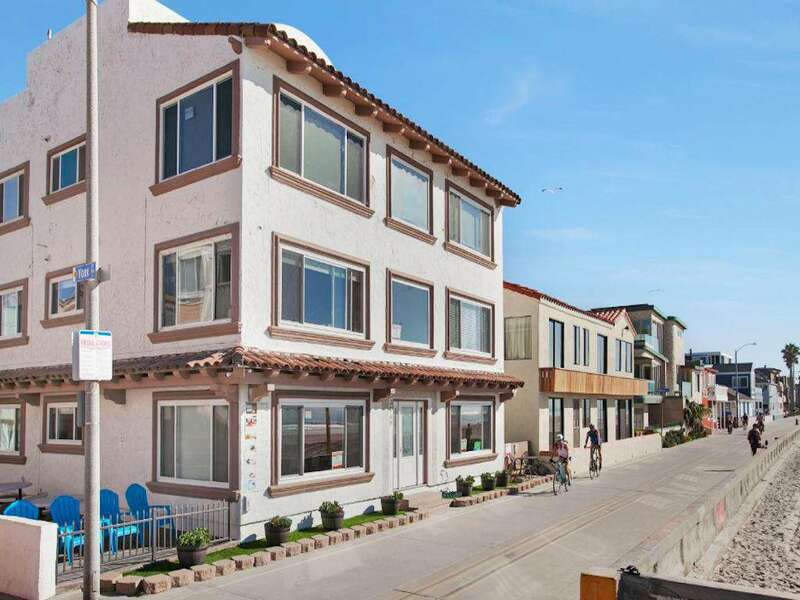 Come stay at this newly remodeled ocean view condo You will be a stones throw away from the Ocean in beautiful Mission Beach San Diego. Centrally located just North of Belmont Park and very close to Sea World. 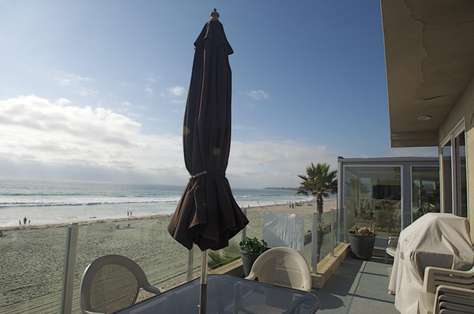 This 2 bedroom 2 bath condo is beautifully decorated and comes with all that is needed for a getaway to America's Finest City at the funnest beach in Southern California. Includes a shared rooftop deck. 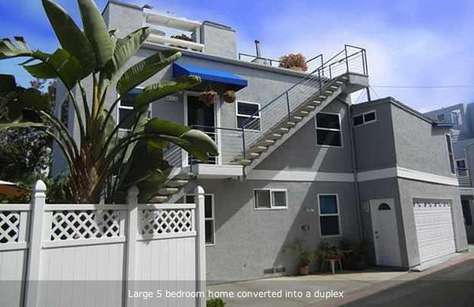 Very Close to the Ocean in the best location only 2 blocks North of Belmont Park. Perfect for a large family or group of friends with two fully equipped kitchens, two living rooms and two oversized washer/dryers. Roof deck is very large and private, with dining table/chairs and lounge chairs. 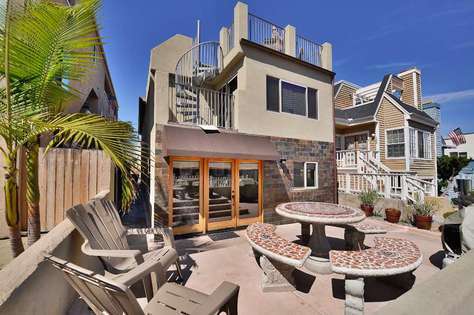 Downstairs has a raised patio with table/chairs - enjoy the sun and spectacular ocean and sunset views from both. All bedrooms have new beds, flatscreen TV's and ceiling fans. All new kitchen appliances and equipment, comfortable living rooms with games for the entire family will make this a home to remember. Upstairs 3 BR/2.5 BA sleeps 8 in beds; Downstairs 2 BR/2 BA sleeps 6 in beds. Both units have two twin fold out futons ideal for young children. Residence is air-conditioned, all windows are dual pane to keep out the noise. Large two car garage, plus a third space behind the garage for over-sized vehicles. #360 Oceanfront 3 BR Penthouse fun in the sun. The perfect panoramic ocean view from a spacious, fully remodeled ocean front home in South Mission Beach. Whether it is relaxing to the sound of rolling waves and watching the sunset into the Pacific or pursuing the active beach lifestyle of volleyball, surfing, and biking on the boardwalk, this home will not disappoint. The balcony is the ideal spot for people watching while grilling lunch and relaxing with cold drinks. New flooring and an updated kitchen definitely upgrades the pleasure and comfort of staying in the home. Excellent for large families looking to build cherished beach vacation memories. Sleeps 6 in beds, with a maximum of 10. Has a two car garage.